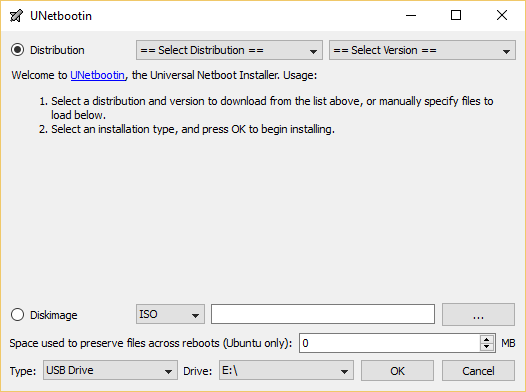 New users tend to flock to distributions with easy to use installation programs, that is, to distributions with graphical installers. Some people will probably disagree with that statement, but most users feel more at home with a point-and-click interface, than with a terminal (console) program. That is why, in my reviews, I tend to place some emphasis on the installation program and installation process. A non-graphical installer brings no real advantage to the table. While it is true that not all distro developers have the resources to code their own graphical installer, or to code a good one, I do not think that it is always necessary to roll your own installer. After all, we are talking about free software here. So to those distro developers without the resources to code a new graphical installation program, my only advice is, find an existing one that you like, one that you can work with, and fork it. That is how Sabayon’s developers gave their distribution a good installation program. 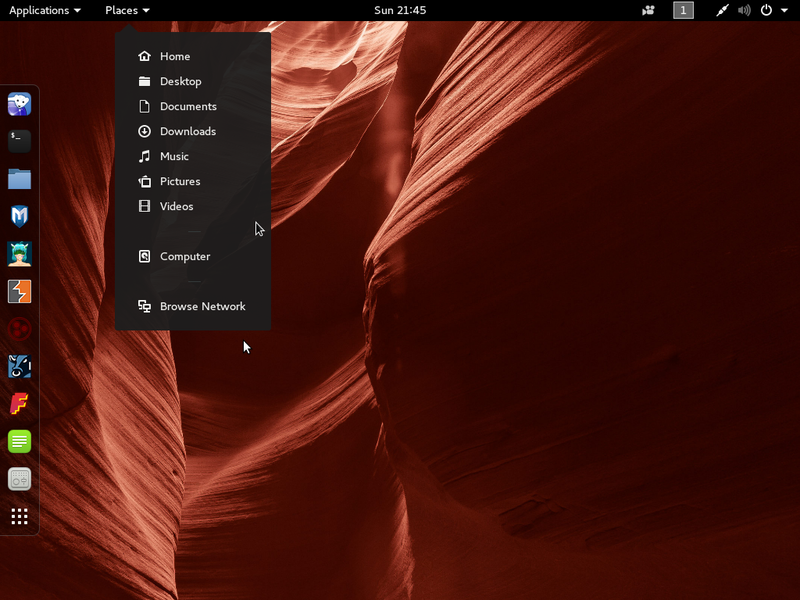 With the introduction out of the way, the rest of this article brings you a list of the best graphical installation programs available on active Linux and BSD desktop distributions. And not to get entangled in the knotty issue of deciding which one of the bunch is the best, they are listed in alphabetical order. Anaconda is the installation program of Fedora and other distributions derived from Fedora. The latest version used in Fedora 16 is version 16.25. A slightly modified form is used in Sabayon, and a very old version is still in use in Foresight Linux. It is the most feature-rich of the installation programs available on any Linux or BSD distribution. 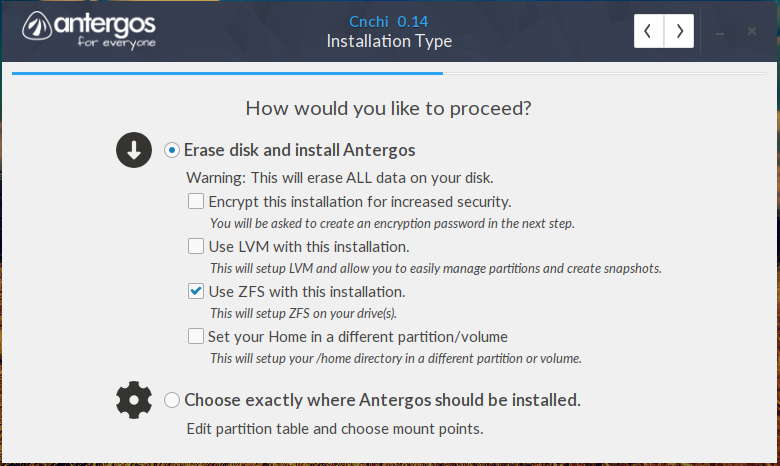 Pros: Support for LVM, the Linux Logical Volume Manager, RAID, disk encryption, and boot loader password-protection. Support for installation to both local and remote storage devices. Besides the manual configuration option, features several automated disk partitioning methods. Anaconda 16.25 is the first version to support and use (by default) the GUID Partition Table (GPT) in standalone installations. 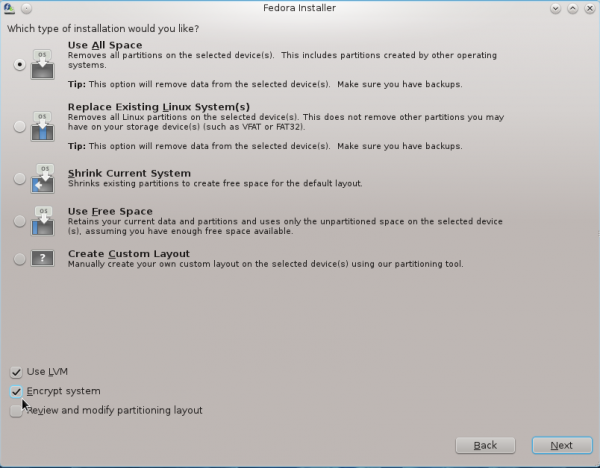 (See Fedora 16 GPT disk partitioning guide.) Aside from support for whole disk encryption, individual partitions can also be encrypted. Cons: None that I am aware of, but the timezone configuration step could be better. Shown below is the disk partitioning methods step. 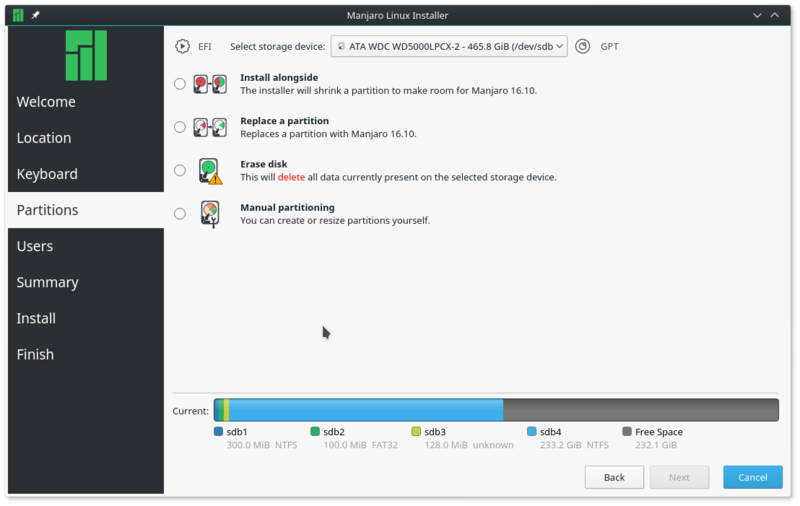 And a partition configuration window. DI, the Debian-Installer, is Debian’s installation program. It has an ncurses interface and also a purely graphical, point-and-click interface. Very few distributions that are based on Debian actually use DI. Most choose to craft their own installer, while maintaining compatibility with the package manager and repositories. Pros: LVM, RAID and disk encryption support. Also supports password-protecting the boot loader. Can be used to install any supported Desktop Environment. Cons: Installing a Debian system (using DI) involves far too many steps and one too many mouse clicks than any other installation program. A feature that takes just one step to configure in other installation programs usually takes several steps in DI. This screenshot shows DI’s automated and manual partitioning methods. 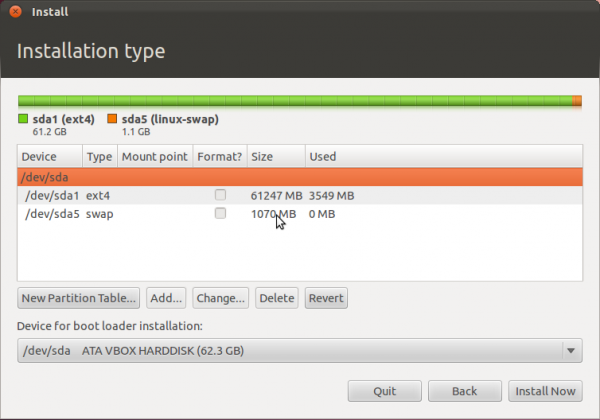 And this, the partitions configuration window. Pros: LVM, RAID and disk encryption are supported. 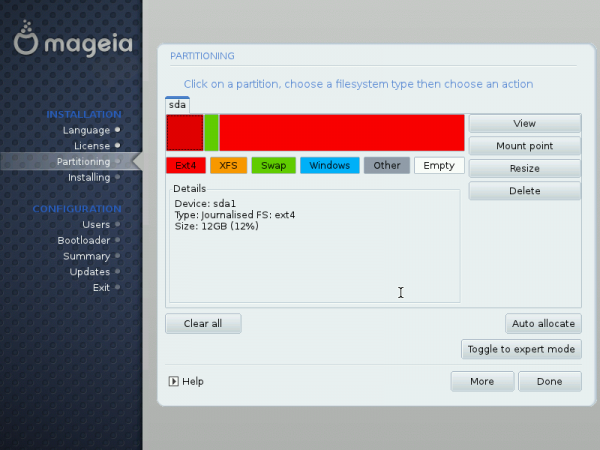 Like DI, the Debian Installer, offers several automated partitioning options. Cons: Lacks a BACK button in critical steps of the installation process, especially during the disk partitioning phase. Shown here is the disk partitioning methods step. And the manual disk partitioning window. 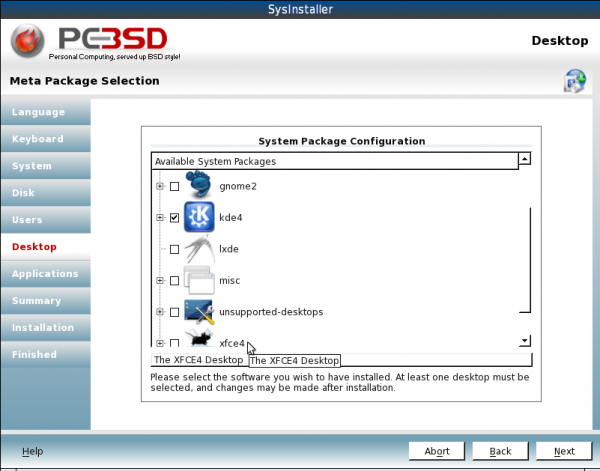 SysInstaller, or PC-SysInstaller, is the installation program of PC-BSD, a KDE distribution based on FreeBSD FreeBSD distribution with KDE as the main desktop environment. It offers more configuration options in less steps than other installation programs in this article. It is, in a sense, what DI is not. Pros: Support for GPT. Like DI, it offers options to install Desktop Environments other than KDE. Cons: Lacks support for boot loader password-protection. 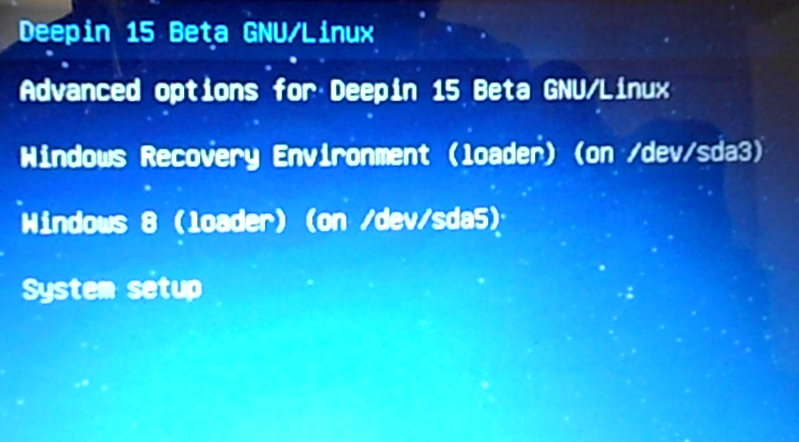 Shown in this screenshot is the desktop configuration step, where you can choose what Desktop Environment to install. The default is KDE4. And this is the disk configuration step. Advanced disk setup does not get any simpler than this. Note that this screenshot was taken from a release candidate of the upcoming PC-BSD 9. Ubiquity is Ubuntu’s installation program, Compared to others in this list, it is very lite, having very few features other than the very basic. 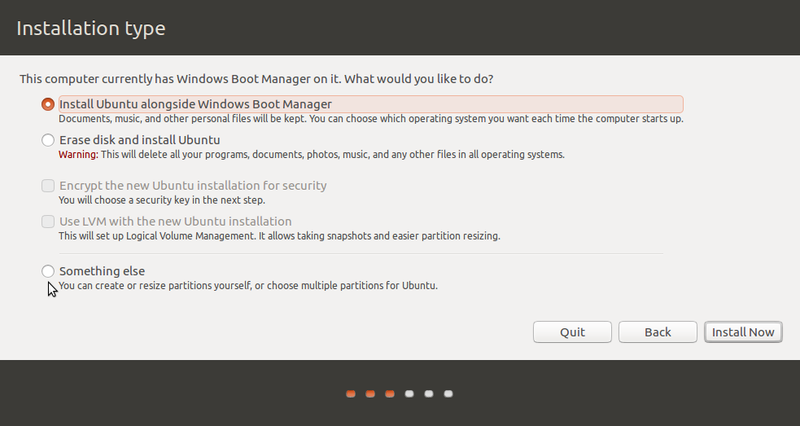 It is the installation program on the Live CD edition and the Live portion of the DVD edition of Ubuntu Desktop. Pros: Automatic timezone detection using Maxminds GeoIP database. Support for home folder encryption. Keep in mind that the physical security benefits of home folder encryption are minimal, but it is better than nothing. Offers the easiest disk resizing feature. Cons: Lacks support for LVM, RAID, disk encryption and boot loader password-protection. When attempting to set up a dual-boot system between Ubuntu and another Linux distribution, the installer cannot detect the other distribution, if that other distribution is installed on an LVM file system. This screenshot shows the screen resizing step of the installer. And this, the manual disk configuration step. YALI:, or Yet Another Linux installer, is the installer program of Pardus, a KDE distribution developed by the Turkish National Research Institute of Electronics and Cryptology (UEKAE), an arm of the Scientific and Technological Research Council of Turkey (TÜBİTAK). YALI is the coolest and most modern of the installation programs featured in this article, and Pardus is a top 6 KDE distribution of 2011. Pros: Support for LVM and RAID. The only installation program that can be restarted without rebooting the computer. In terms of look and feel, the best of the bunch. Cons: Lacks support for disk encryption and boot loader password-protection. The screenshot below shows available disk partitioning methods. The manual disk configuration step of YALI. The two previous commenters took the words right out of my mouth. I feared YaST was going to be ignored when Anaconda was called out as being the most feature-rich right at the beginning. 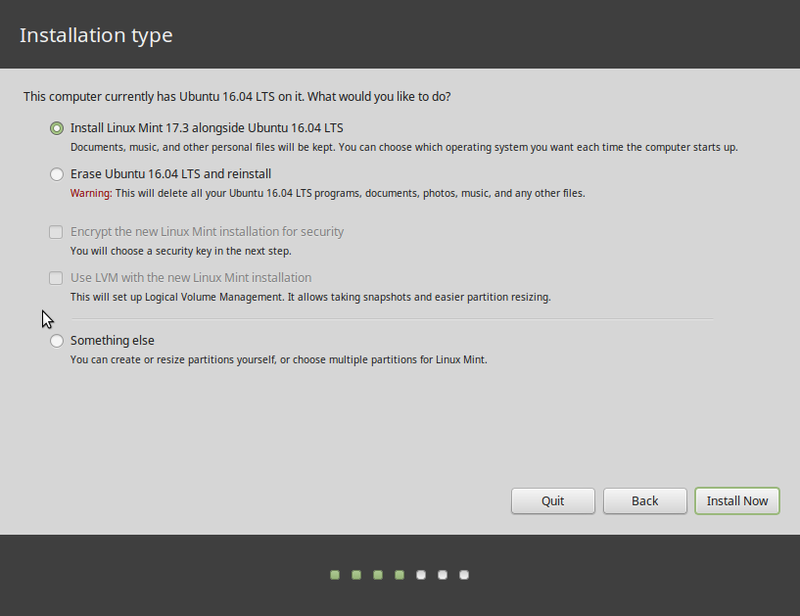 In my own experience installing Sabayon, two features that stand out as missing compared to OpenSUSE’s install are the comprehensive help and the ability to select/deselect individual applications to install. Of course, there’s also the option of the ncurses text interface, the ability to set details as small as the timeout before GRUB loads the default OS, a much simpler and more powerful way to choose how the system boots (MBR, partition – and partition location, etc. 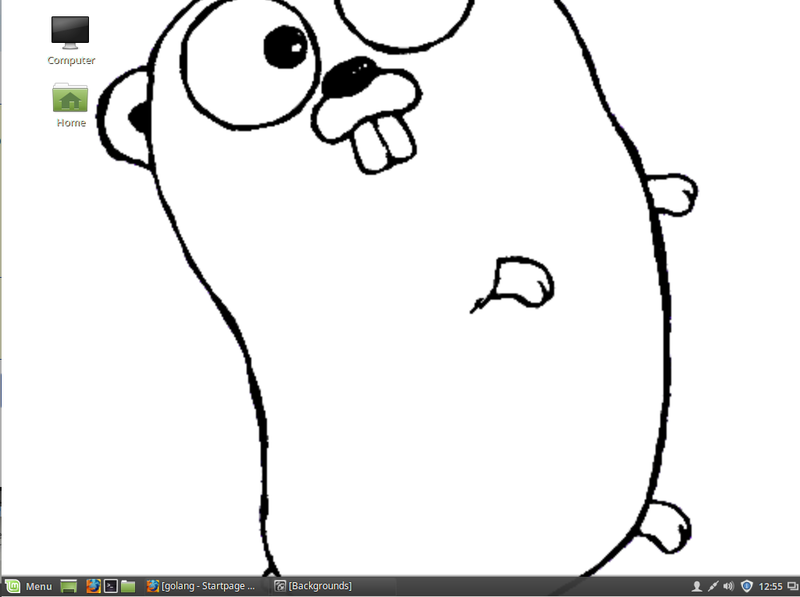 ), the ability to configure hardware – OpenSUSE was the only install that allowed me to choose a default soundcard on a system that had both an external and onboard sound enabled, the fact it has intelligent behavior like asking if the user wants SSH enabled and opening/closing the port in the firewall as appropriate, the ability to install all system updates before dropping into the desktop so that the user has the most flawless/safest experience, the ability, if the kernel isn’t replaced via update, to perform the entire installation/configuration without rebooting, etc. PC-BSD is a “KDE distribution”? You mean like Ubuntu is a Unity distribution? What on earth are you talking about? Do you even know what a distribution is, and how the BSDs are not one? Did you proofread this copy? By the by, the easiest Linux installer I’ve ever used, bar none, was Slackware’s. Of course it relies on the user knowing the difference between the computer and the monitor; knowledge being bled out of computer users as the Mac-ification of Linux continues apace. 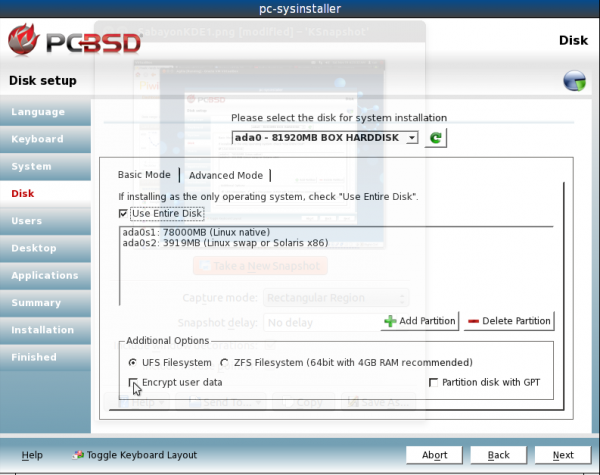 We can say that PC-BSD is a FreeBSD distribution that uses KDE as the main DE. So you have a point there. But if a text/ncurses installer is your idea of the “easiest Linux installer,” then keep using Slackware, and let the rest of us that do not know “the difference between the computer and the monitor” use point-and-click installers. You must be one of the smartest guys around. I’m also sure that you prefer stone tools to modern knives. By the by, feel free to diss the inventor of the web for pointing this out. I’m sure you’re more accomplished and intelligent than Tim Berners-Lee. Oh come on. Do an article on graphical installers and forget YaST??? On what planet are you living??? Hi, you are not mentioning YaST – openSUSE’s installation and configuration management tool. Looking at the options above, I think it’s superior to some – if not all of them 😉 – so should be mentioned.